Below are the final JP rankings of the regular season. We account for the Army-Navy game in our rankings and I have no idea why the college football playoff (CFP) committee does not. Interestingly, Bowling Green has stealthily worked their way to #7, just ahead of Stanford. 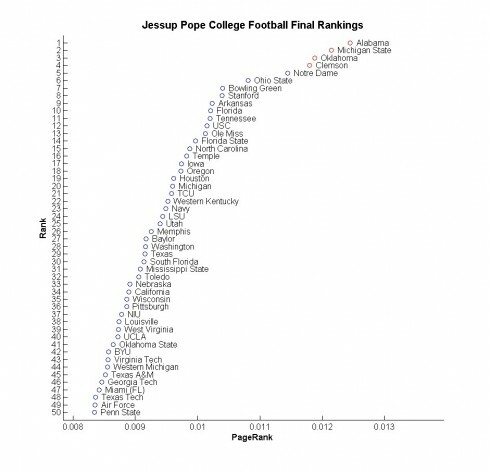 You might recall from our initial post that we fully expected our rankings to increasingly cohere to expectations as the season wore on (e.g., observe that we share 7 of the same top 10 as the final CFP rankings) yet nonetheless end with some surprises, and I’d say that is exactly what has happened. Whenever I tell people about the success of our ranking system, one of the question I am reliably asked is “yes, but how does it fare against Vegas?” I agree that Vegas is an appropriate benchmark for success in that they excel at selecting a favorite and setting an appropriate line (Vegas’ goal is for bettors to be evenly divided between the two sides of the line as that is how they make the most money with the least risk). In our first post I mentioned that we have beaten Vegas 56% of the time, a claim much easier to make than to substantiate. So here is our chance to back it up by making a priori predictions. Below you can find our forecasted winners for all 40 bowl games other than the national championship. Each of the bowl opponents are listed in the table below, the Vegas favorite is the first team listed (odds are even for the last two bowls), our projected winner is in bold, and our projected win margin is in the rightmost column. There are two games in which we predict rather large margins of victory: Bowling Green over Georgia Southern by approximately 4 touchdowns and Arkansas over K State by more than 3 TDs. None of these teams are ranked though both of our projected winners are favored by Vegas. Another interesting match-up involves North Carolina and Baylor: our system has had less respect for both of these teams (relative to the CFP) all season. Nonetheless, our two systems end up making the same prediction in this match: NC over Baylor. Perhaps even more curiously, Vegas favors Baylor. I find this curious because when there is disagreement between the 3 systems about the favorite, this is the least likely event (other possible events: (1) Vegas and our system align but not CFP, (2) Vegas and the CFP align but not JP). Also, though our system favors Oklahoma over Clemson, in contrast to the CFP, Vegas currently favors OU by 4. This puts our system in the strange situation of being guaranteed to outpredict one system (either the CFP or Vegas) but virtually guaranteed to lose to the other. Only if OU wins by 1-3 points can our model beat both systems. 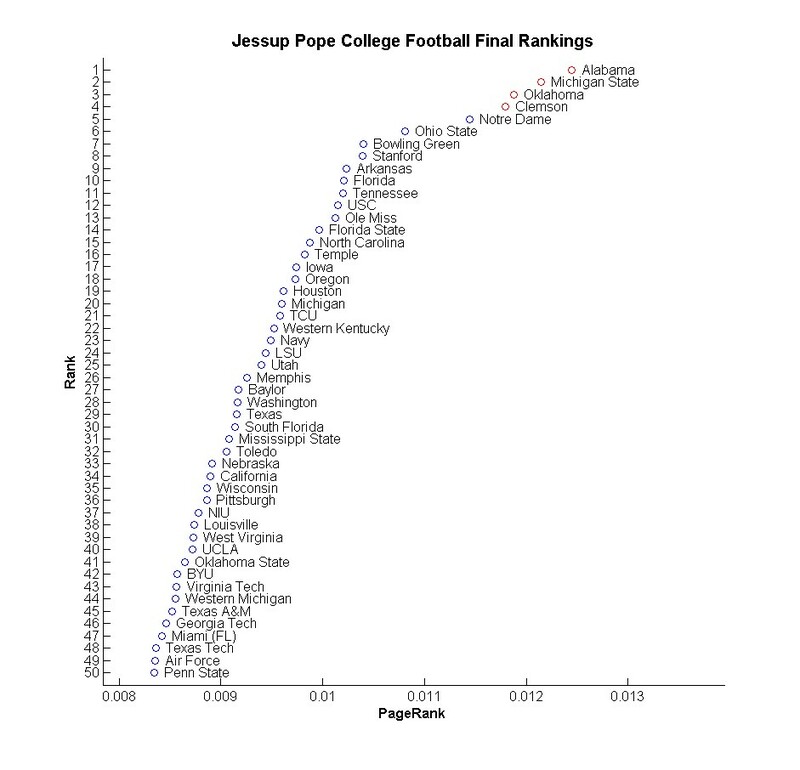 My favorite bowls are where the CFP and Vegas align against the JP rankings, such as the Fiesta Bowl where both our competitors agree that Ohio State will defeat Notre Dame yet our system nonetheless predicts an Irish win. Lastly, our system appears to have little respect for the Big 12 – only predicting 2 wins out of 7 games. Conversely, it expects Pac 12 and SEC teams to both win 7 out of 10 games.